So you've got one of the new Infiniti G 25 s with the dual throttle body setup. Pretty cool, huh? Now it is time to take your Infiniti's air intake system to the next level. Get rid of those boring restrictive air boxes and replace them with the Injen SP1961 Infiniti G25 short ram air intake system! You'll get two top of the line replacement air intake systems complete with heat shielding for more power, more torque, and a great look! This Injen Air Intake System is a traditional, underhood intake system that is placed in the stock location of the factory airbox system. 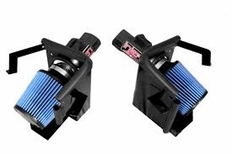 If you have air flow sensor(s) on your factory intake, don't worry! Existing sensors will bolt directly to your new Injen intake system. Every system is certified or pending California Air Resource Board and backed by Injen's lifetime warranty. What Makes Injen Intakes better than their competition? Not only are all Injen Technology Intakes made in the USA, Injen cool air intake systems feature MR Technology, developed by Injen to maintain safe air/fuel ratio and highly efficient tuning. Injen also does extensive dyno tuning and r&d before releasing an intake, unlike many other companies who take an "if it fits, use it" attitude to aftermarket intakes. Each system is built from 6061 T-6 aluminum alloy to ensure the lightest design possible. New Level Motorsports is an Injen Direct Authorized dealer. The Part number for this item is: SP1961BLK and it fits 2011-2012 Infiniti G25 2.5 V6 models.